I don't know if it's too early, but I have had Christmas on the brain! I haven't stopped dreaming up quilts and decorations I want to make for the festive holiday. Perhaps it's the sudden change in weather we had? normally we have quite an extended summer in September here in Cornwall, though this year was quite different and it seemed to turn to Winter almost overnight. Whatever it is, I'm thinking it's a good thing as every year I leave all the Christmas making to the last minute and never get half my list of things done. I'm *really* hoping this year will be different, as I have a whole host of things I want to make and share. Do you ever think so much about something you want to make that you literally obsess over it? Well, I do - only sometimes though. Case in point, the Radiant Star block. This design is featured in a Christmas quilting book I acquired over the summer. I've thought about it so much and even went to the trouble of buying in the Kona solids Tomato and Willow for my Sew and Quilt shop! 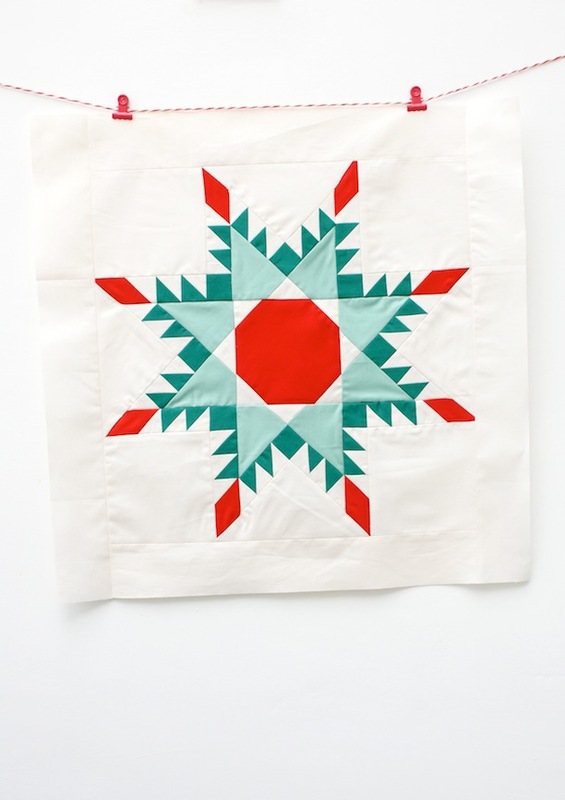 I can't stop looking at it, it's one of my favourite things I've made :) I really love the traditional quilt blocks, combined with the crisp red and green solids. Now I know the piecing is far from perfect! but actually I really don't care so much. Normally it would bother me but I just can't wait to get it quilted and hung up on the wall somewhere! Next up on the list of things to make were these padded tulip hearts. I love this little block, and thought they would look really cute in country style hearts. I took some photo's of the process and once I figure out how to transfer a paper template I've drawn out onto the computer for you all to download for free - I will share the tutorial! (if anyone can enlighten me with this sort of thing it would be much appreciated!). I know exactly what you're talking about! I get super excited about making something and it's all I want to do. My "to make" list is so long I'll be surprised if I ever make everything I'd like to though.. Your star block and your little hearts are lovely. I have already started sewing my Christmas projects, but my list just keeps getting longer and longer! I have seen so many lovely things posted by the bloggers. Thanks for sharing and Happy Stitching! Beautiful makes, I love your block! I was going to say exactly the same as Kerry! they are all lovely, Jessie! Oh, also, can you link to the book where you got the snowflake pattern? I might need to make me my own winter snowflakes quilt! Your new star block looks really very nice!!! And the hearts... Oh, really very nice Christmas decorations!!! Good job! I love your star! It's perfect for Christmas, the colors are so eye-catching! Love your projects, especially the block: how big is it? Beautiful star and it looks so intricate too! I'm SOOoooo in love with these! PS: you should add "follow by email" widgit to your blog! Love that star and the tulip hearts - delightful! How are you planning to quilt the star? And can you share the pattern, or at least the size so that I can draft my own? Thanks! The star is just beautiful. Please will you let us know which book it is as I'd really love to make one. Please let us know what book that star came from. It's lovely. Your choice of colors is what makes it so brilliant! Love, love this block!!! The colors are amazing. Kona tomato, willow and what is the third color? Thank you!